Google Has Made a Phone People Will Want — But Can It Topple the iPhone? At its “Made by Google” event on October 4, Google showed it was willing to move aggressively against rivals like Amazon and even collaborators like Samsung. But there was only one company that it overtly threw shade at: Apple. 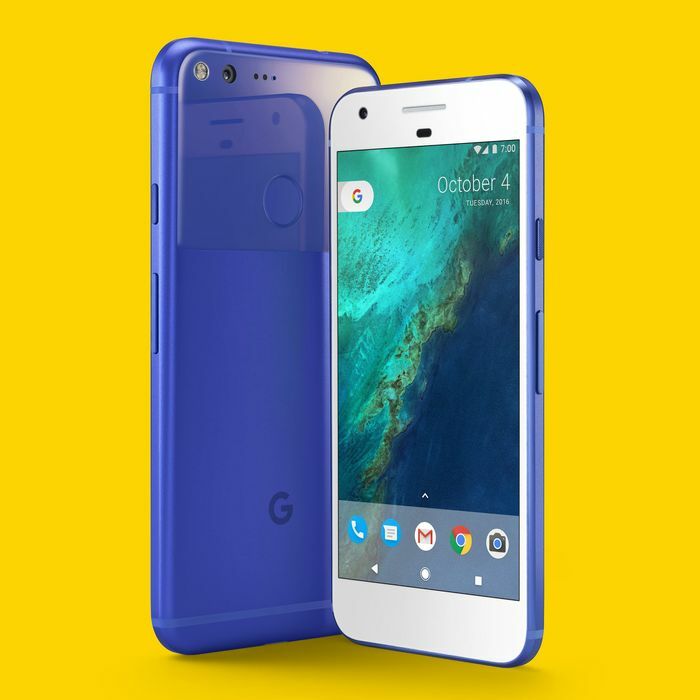 With the release of the first phones that Google designed almost entirely from the ground up — the Pixel (starting at $649 for a 32GB) and Pixel XL (starting at $769 for 32GB) — selling at nearly the exact same price point as the iPhone 7 and iPhone 7 Plus, it’s clear Google is eager to go head-to-head with the world’s most prestigious smartphone. Samsung, the global leader in smartphones, currently has a very smoky, very unpleasant halo attached to anything it sells. And there seems to be consumer disillusionment with Apple’s latest offering. So, will Google be able to capitalize? Let’s start with Google’s big selling point: the Google Assistant. 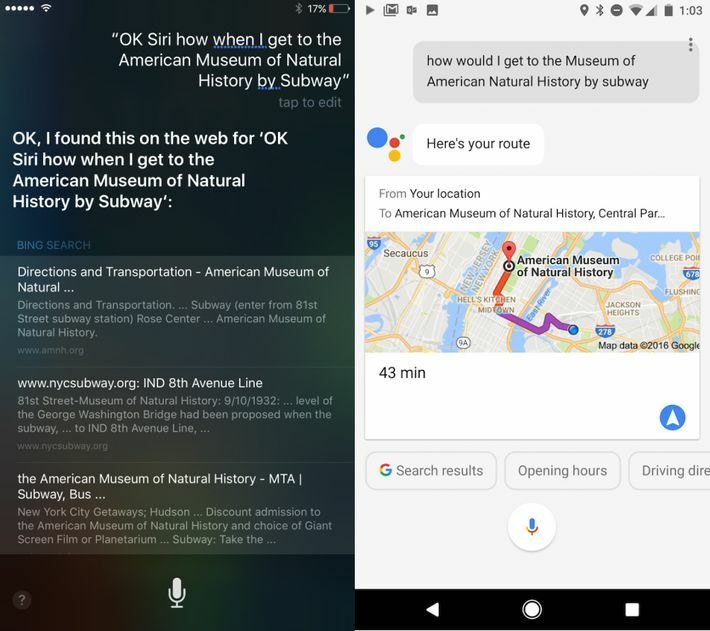 I spent a weekend using Apple’s Siri and the Google Assistant side by side, and there’s no question that the Assistant understands questions, follow-ups, and provides relevant information more often and more conveniently. 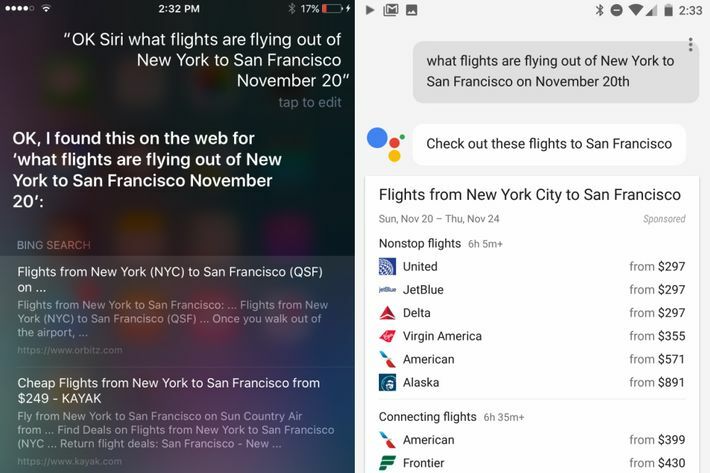 While Siri simply directed me to some Bing search results about flights from New York to San Francisco, Google Assistant laid out my available options by both cost and flight time. But, really, even if I can talk to my phone quickly and easily and get it to do things of actual utility, do I want to do that in public? All of the testing I did was in my apartment — I still get middle-school jitters about pulling out my iPhone or Pixel and talking to it like some sort of Forrest Gump–ian version of Spike Jonze’s Her, like at any moment I’ll be shoved into a locker. While Google somewhat allows me to avoid this awkward experience by typing my queries into the texting app Allo, by the time I’m typing on my phone I’m already at the point where it’s just faster to do it myself. 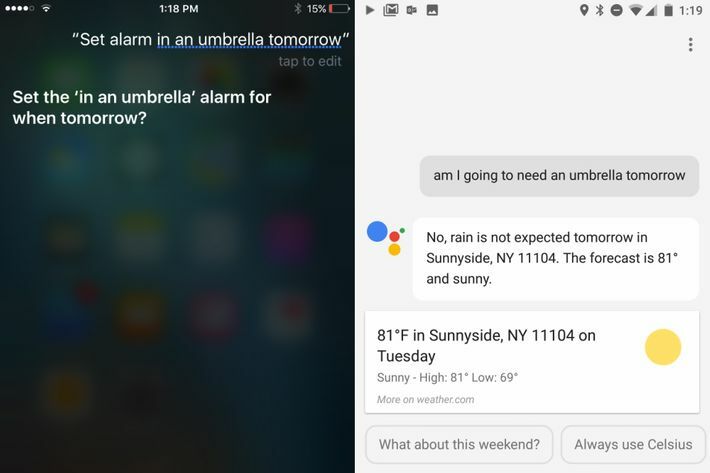 The Google Assistant, much like Siri when it first debuted years ago, shows a lot of promise — but we are years away from it being even close to where it’s culturally acceptable to chitchat with your smartphone, and the mind shudders at what a noisy and shitawful dystopia that would be. So, how’s the actual phone? There’s no doubt that Google took its basic design inspiration from the iPhone. The most common comment I got while using it was “This thing looks a lot like an iPhone.” And it’s true — while the Pixel doesn’t look exactly like Apple’s most recent model, you could easily spot one across a room and think it was an iPhone 6 or 6s: the same rounded corners, the same top and bottom bezels, the same aluminium sheen. Samsung managed to differentiate itself with its curved glass and slightly ’70s sci-fi throwback industrial design. The Pixel, designed in close concert with HTC (not known for being particularly bold in its own design), looks like dozens of other phones on the market — albeit a sleek and high-end one. The, ah, influences are quite clear on what the Google Pixel was aiming for. There are notable differences, however, between the iPhone and the Pixel once you pick them up. While the Pixel and the iPhone 7 feel roughly equivalent in your hand, if you choose to upgrade there’s a noticeable difference in both the size and the weight of the iPhone 7 Plus versus the Pixel XL. The iPhone 7 Plus can often feel unwieldy to use one-handed, and I’ve had trouble getting it to fit (and stay) in my pocket. The lighter-weight XL shaves a few millimeters off in each dimension, creating something much easier to carry one-handed and that slips into my pocket with ease. Which is impressive, because the Pixel XL not only sports the exact same screen size as the iPhone 7 Plus, but it also has an AMOLED screen (basically, a screen that allows blacks to be really black, and bright, contrasting colors to really pop) compared to the iPhone 7 Plus’s relatively outdated 1080p LCD screen. Simply put, the same photo seen on an iPhone 7 or iPhone 7 Plus is going to look ever so slightly worse then one shown on a Pixel (or any of the numerous phones sporting OLED screens, including the Samsung Galaxy S7 line). The effect is magnified if you’re watching a movie or playing a game on your phone — things in motion and dark sequences in films just look much, much better. The OS, thanks to running a clean and bloatware-free version of Nougat 7.1 (the newest version of Android), is smooth. The decision to simply place all apps in a drawer that you pull up with a swipe from the bottom seems cumbersome at first, particularly if you have hundreds of apps. But in reality, you can quickly search for what you want, and then place your most-used programs on your home screen. It allows you to selectively build out a homepage that’s useful to you, instead of spraying dozens of apps over five to six pages. It’s a move Apple would do well to ape. Also nice: If you look at the specs of the Pixel and the Pixel XL, they’re essentially the same phone with the same specs, except the XL has a larger battery and screen. This allows users to simply choose which phone sits more comfortably in their hands — with none of the hard choices iPhone 7 buyers faced between the single-lens iPhone 7 and the dual-lens iPhone 7 Plus. And I suppose it needs to be said: Both versions of the Pixel also come with 3.5mm headphone jacks. Thanks to the Pixel’s beefy processor, applications load quickly, and the phone (so far) moves much smoother than any Android handset I’ve tried to date. I’ve scrolled quickly through graphics-heavy web pages without a hitch and tried out the burliest 3-D games I could find, and none seemed to phase the Pixel (at this price point, it would be odd if it did face hiccups). The XL’s hulking 3,450 mAh battery meant that I was able to charge it at work on a Friday and have it still be working on a Monday — albeit needing a charge relatively quickly. The single-lens camera quickly comes up if I press the power button twice, and the camera itself is robust and able to take great shots in a good light and decent-to-good ones in lower light (though the iPhone 7 Plus seems to be able to handle shots at dusk and evening much better). The camera, besides offering somewhat standard options like slo-mo and panoramic shots, also offers “Lens Blur,” Google’s attempt to fake depth of field, much like Apple is able to do in its own Portrait mode. However, in my limited testing, this rarely worked as well as I hoped — pictures came out looking more like I had randomly used the tilt-shift tool in Instagram, and less like I was using an actual SLR camera. 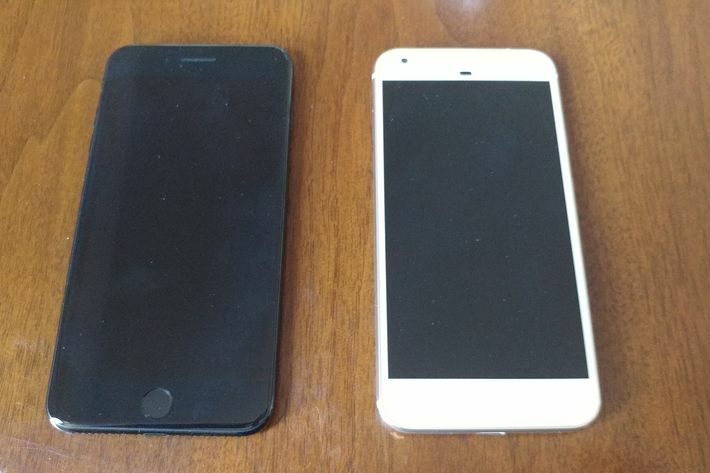 For instance, in the photos below, the Apple iPhone 7 is on the left and the Pixel XL is on the right. 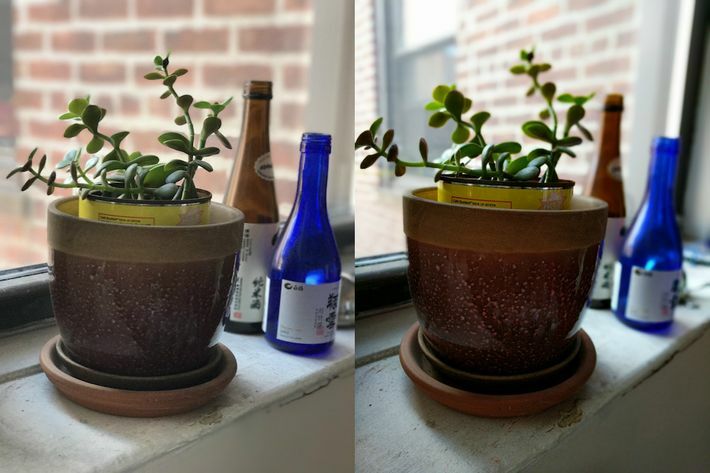 The Pixel does a better job with colors — there’s more vibrance to the red of the pot, or the blue of the bottle. But the Apple Portrait selectively blurs things as they get farther apart, while doing an admirable job of keeping all of the plant in focus. Both of these phones will allow you to take pictures that are going to look great, but right now it’s a bit easier to do that with an iPhone 7 Plus. While it’s not quite Steadicam, the results are pretty remarkable. Should You Switch from Your iPhone? So, should you get a Pixel? If you’re an iPhone user getting by on an iPhone 6 or iPhone 5s and you’re dissatisfied for whatever reason with Apple’s current direction, I think the Pixel is a viable choice. Moving from iOS to Android is not the easiest process, but it is doable. The Google Assistant is nice, but it’s the Pixel’s overall sleekness and solidity of design that impress me the most. Whether you’re willing to make the jump will largely depend on what carrier you’re with (Verizon will have the in-store exclusive on the Pixel, though unlocked Pixels will be sold on the Google Store). But leaving the Apple ecosystem is not something to be done lightly. By the time I vacated iOS, I had spent at least $1,000 on various songs and games and other electronic effluvia. Once you’re on Android, not only do you get those [extremely iPhone voice] déclassé green bubbles in your text messages, but there will simply be parts of Apple that you will not be able to access. Whether that’s enough to keep you on iOS is a choice you’ll have to make. But! I will say this about making the jump: If you’ve had a Gmail account or used Google Maps or many of their stand-alone products, you’ve already given Google quite a bit of your information. While this may seem creepy at first, it also means that an Android phone — especially one with Google so firmly in the driver’s seat — will not only know your commute for work, but will also give you heads-up when your normal subway line is running late. These things are possible in iOS, but they don’t happen of their own accord like they do on Android. Google’s approach verges on Big Brother, but the convenience is hard to ignore. Should You Switch from Your Samsung? So what about people not on iOS? Then, I think, the answer is much simpler. If you don’t mind paying a premium price, I think the Pixel is the best Android phone currently available. If you’re looking to upgrade and stay within the Android ecosystem, this is the phone to buy. While Google obviously is aiming this phone as a shot across Apple’s bow (I’m 80 percent sure that’s the correct nautical idiom? ), the manufacturer that should be truly worried about all this is Samsung. The leading global manufacturer of phones — and indeed, the company that was outselling the iPhone for a period in early and mid-2016 — has been able to reign because the premium market for a high-end Android was essentially empty. HTC has done its best, without much success. LG puts out very good phones every year that never seem to catch many consumers’ eyes. OnePlus is tremendously popular with those who salivate over specs, but almost no one else. Huawei may become a real player in years to come, but it’s too soon to tell. Moto smartphones are great buys, but they’re aimed at price-conscious consumers, not those seeking the latest and great. But Samsung is just a manufacturer — it will likely need to license Android from Google for the foreseeable future. And Google has just put out a phone that I think stands toe-to-toe with the best Samsung phone out now that doesn’t explode: the Samsung Galaxy S7 Edge. It’s not going to be a fair fight. Google may have been gunning for Apple, and someday it may be able to put out a phone so objectively better than anything out of Cupertino that it could fundamentally shake up the landscape of premium smartphones. But what’s going to happen in the meantime won’t be a battle between Apple and Google over who makes the better phone. It will be Google’s deep pockets versus every other Android manufacturer out there. You can argue about whether monopolies are good or bad for tech consumers. But it’s hard to argue that we’re not seeing the early days of a brand-new one in the Android mobile space.